This ubiquitous, boring mushroom is my Laccaria nemesis. I'm constantly making Laccaria collections that I'm sure represent a different, more interesting species . . . only to have my hopes dashed once I get out the microscope and Laccaria literature. Once again, Laccaria la-freaking-ccata. 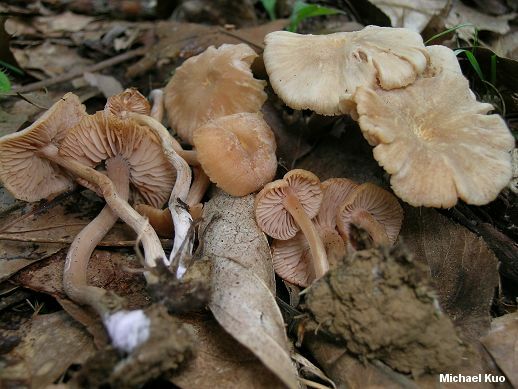 The hallmarks of this balloon-bursting species are its dull orangish brown cap and stem; its thick, (Caucasian) flesh-colored gills, and the white mycelium on the base of the stem. It is usually small to medium-sized, relative to other Laccaria species--but it is occasionally large or very small, creating confusion. 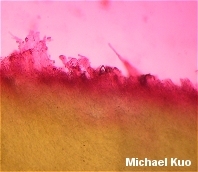 Under the microscope Laccaria laccata features round spores with spines about 1-2 µ long and 1 µ wide at their bases, four-spored basidia, and scattered bundles of upright elements in its pileipellis. 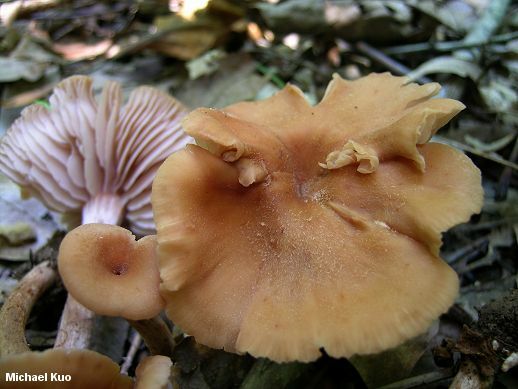 Despite its inclusion in many field guides Laccaria laccata is often fairly difficult to identify without using a microscope, since it is so variable in size and since it associates with both hardwoods and conifers across North America. However, if you are absolutely, positively certain your Laccaria has white, rather than purplish, basal mycelium (see the discussion on the page for Laccaria bicolor before you decide)--and your collection was made under hardwoods in eastern North America, without any conifers present--you may be able to identify Laccaria laccata without recourse to microscopic analysis. The official name for the widespread North American variety discussed here is Laccaria laccata var. pallidifolia Peck (1890). Ecology: Mycorrhizal with hardwoods or conifers; growing alone or gregariously (sometimes in loose clusters); common; spring, summer, and fall; widely distributed in North America. Cap: Usually 1-4.5 cm across, but sometimes larger or smaller; convex, becoming flat and sometimes uplifted; often with a central depression; the margin smooth and even or lined to grooved; bald to finely hairy; orangish brown, fading to buff; color often changing markedly as it dries out. Gills: Attached to the stem, or beginning to run down it; distant or close; pinkish (Caucasian) flesh color, sometimes developing a faint purplish cast. 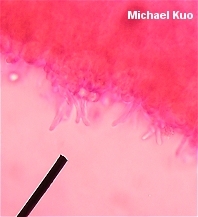 Stem: 2-10 cm long; up to 1 cm thick; equal or tapering to base; smooth to finely hairy; occasionally longitudinally grooved; colored like the cap; with white basal mycelium; becoming hollow. Flesh: Thin, colored like the cap. Odor and Taste: Taste mild to slightly radishlike; odor similar. 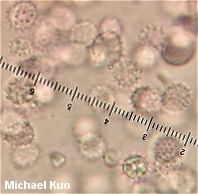 Microscopic Features: Spores 7-10 µ; subglobose to globose; ornamented with spines 1-2 µ long and about 1 µ wide at their bases; inamyloid. Basidia 4-spored. 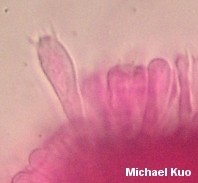 Cheilocystidia usually present; filamentous to subclavate; up to about 55 x 7.5 µ. Pileipellis a cutis of elements mostly 3-7.5 µ wide, with scattered bundles of upright elements; terminal cells subclavate to subcapitate. REFERENCES: (Scopoli, 1772) Cooke, 1884. (Fries, 1821; Saccardo, 1887; Smith, Smith & Weber, 1979; Arora, 1986; States, 1990; Mueller, 1991; Phillips, 1991/2005; Lincoff, 1992; Metzler & Metzler, 1992; Horn, Kay & Abel, 1993; Evenson, 1997; Mueller, 1997; Barron, 1999; Halling & Mueller, 2005; Osmundson et al., 2005; McNeil, 2006; Miller & Miller, 2006.) Herb. Kuo 11209401, 06129604, 06160203, 05260301, 07280605; 05280705; 07100803; 06221008.